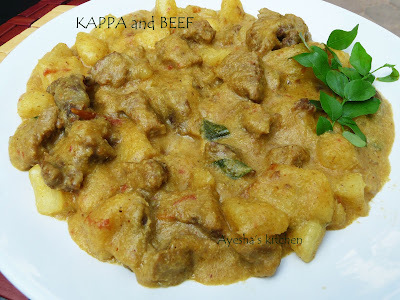 Tapioca and beef / Kappa biryani is a dish which is common in the Southern part of India, especially in Kerala. This is a dish needs no introduction among Keralites. Tapioca is still a staple food in many parts of Kerala. There are so many dishes available in Kerala with tapioca such as kappa mathi curry (Tapioca with sardines), Kerala kappa masala, Kappa thalichath, kappa upma and so on. Among these dishes, the combination of tapioca with beef or with fish is widely popular. This is called as Kappa biryani, Kappa erachi, mashed tapioca with beef, Tapioca biriyani, Malabar style erachiyum kappayum and so on. Pressure cook tapioca with adequate water and salt for 2 whistles or until done. When done, drain the excess water and set aside. Dry roast coconut, shallots, fennel seed, curry leaves in a non-stick pan until slightly golden, in a very low flame. Once cooled, make a thick paste by adding some water. It should be very thick and creamy. Set aside. Meanwhile, prepare the beef in another pressure cooker with all the ingredients above given for cooking beef ( you can also cook the beef after cooking tapioca). Cook for two whistles or until it is well cooked. Do not add water as the beef itself will release water. When done, set aside. 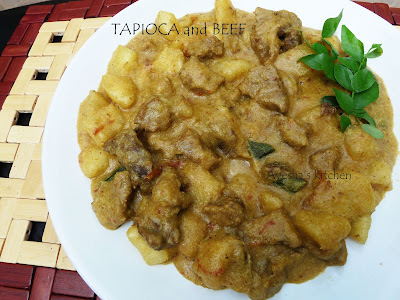 Now add the drained tapioca into a heavy bottomed vessel and add some beef along with some gravy to it. Let it cook for few minutes in a medium flame. Now add the roasted coconut gravy to it and let it cook until the tapioca is well cooked and the tastes well blended. Stir occasionally to prevent sticking from the bottom. When it is well cooked and blended, you can either add curry leaves to it or can do seasoning by heating a pan with 1 tbsp of oil and fry some chopped shallots, until golden and then pour it over the gravy.